The dome in the centre represents a well of the human imagination where dreams, fairy tales and the lands of faraway places unknown to man exist. From that an explosion of life – the known falls away, to bring the surreal of the dreamland to life.The grace and elegance of enchanting arum lilies that hug the face like magical flowers and the wings of little fairies that have a feeling for elfish ears. Platinum with its everlasting and intense pure shine never letting go of the dream world once dreamt, always and eternally with you, till the end of time. Oliver has been working at Jack Friedman for 4 years. In 2010 he was awarded 3rd place and won 1st place in 2012 and 2013 in the Plat Africa competition. Howard Friedman, owner of Jack Friedman, saw his potential and encouraged him to take his talent to new heights. Part of his 2010 prize for winning 3rd place in Plat Africa was a trip to Tokyo which he said opened his eyes to the international jewellery trade. He decided to apply to the Creative Academy in Milan, Italy for the Master of Arts in design 2013, emphasis being luxury goods. Only 20 students are selected each year from around the world and ultimately Oliver has been selected to join the Academy in 2014. The course starts early January and finishes end November. The course will consist of 7 months at the academy with lectures and seminars and 3 months internship at one of the Brands of the Richemont Group. 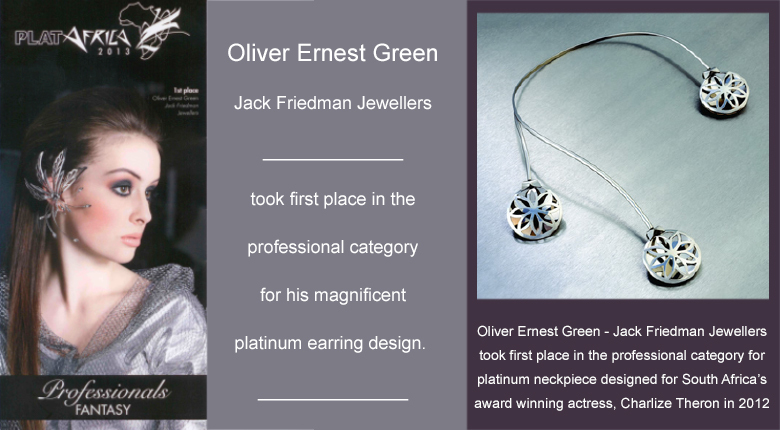 Jack Friedman was established in 1933 and is a third generation jeweler. A woman that receives a Jack Friedman design knows that she is truly loved and owns a treasure. The PlatAfrica jewellery design and manufacture competition is an important annual feature on the South African jewellery calendar. This very prestigious competition assists the design and manufacturing sector to compete anywhere in the world.